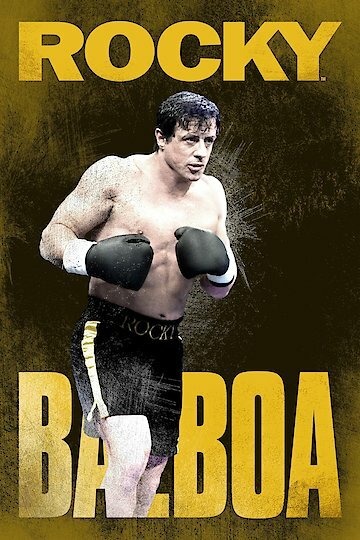 The film Rocky Balboa is a sports drama movie that came out in 2006. It is the sixth installment of the Rocky movie series. In this movie an aging and older Rocky Balboa is living a quiet life. However the current heavyweight champion of the world in boxing is now dominating the sport. One day ESPN does a simulation of legendary boxers and makes a prediction that Rocky in his prime would defeat the current heavyweight champion Mason Dixon. After recovering from his injury from Rocky 4 he is now in good enough condition to fight. Despite his age he decides to fight Dixon as a final match and to leave the sport for good on his own terms. He fights Dixon and loses by decision after the maximum amount of rounds. However the fans and boxing experts all appreciate his performance. In the beginning of the film Rocky Balboa is still feeling depressed after the death of his wife. He is feeling very down and just lives a quiet life. Unlike the previous installment his financial situation is good and he is healthy. At the same time his son is a working professional in Philadelphia but is a bit at odds with his father due to being liked and favored mostly due to his father’s fame and legacy. One day Rocky is watching television and ESPN does a simulation on how different boxers would do if they faced the current heavyweight champion named Dixon in their prime. When it comes to Rocky himself, it is revealed that he would defeat Dixon. Since he wasn’t able to end his boxing career on his own terms, he decides to fight Dixon and see what he has left. During the course of the movie a lot of hype in the press surrounds Dixon after he wins his latest match and finds out about a possible match with Rocky. Dixon accepts the challenge and the two boxers train for the fight. While Rocky is training for the fight he gets his relationship with his son back on better terms. At the time of the fight many people are shocked and amazed at Rocky returning to the ring but nobody expects him to win. However he surprises everyone by fighting very hard and giving Dixon a very tough match. At certain times in the fight Rocky seemed to have the upper hand. However in the end, Dixon defeats Rocky by decision. Despite the loss, Rocky is congratulated by the fans and receives a standing ovation. Rocky Balboa is currently available to watch and stream, buy on demand at Amazon, Vudu, Google Play, FandangoNow, iTunes, YouTube VOD online.